Milind Soman and Ankita Konwar are currently busy chilling in the Maldives celebrating five years of togetherness. Though they got married last year, the couple is going strong since the last five years and in Soman's language, it was time to celebrate Jab they Met. From enjoying the exotic beaches of the country to learning scuba diving and making tons of memories together, the couple surely had a whale of a time and their pictures are proof of it. From kissing during their scuba learning session to enjoying the beautiful morning at the seashore, Ankita and Milind's Instagram clicks make for a perfect holiday album. Milind Soman and Wife Ankita Konwar Being Beach Bums on Their Honeymoon in Hawaii Is Giving Us Major Vacation Goals – View Pic. The couple is already busy celebrating their special day while their anniversary is simply a few days away. Milind and Ankita tied the knot on April 22, 2019, and they will celebrate their first wedding anniversary next month. Is it a pre-anniversary celebration of some sorts for them? We don't know but their holiday pictures are definitely making us anxious to pack our bags and head for a vacay. Guess, not everyone's as lucky as them but there's no harm in dreaming, right? 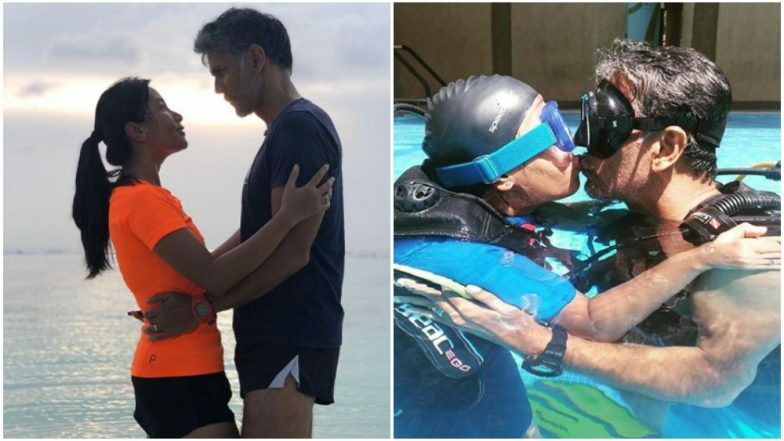 Milind Soman and Wife Ankita Konwar's Pre-Valentine's Day Celebration Will Make You Miss Your Partner - View Pic. Well done @ankita_earthy soon to be scuba expert 😁😁😁 killed the 2 pool lessons!!! #fitterin2019 #keepmoving #nevergiveup thank you @scubareels ! Ankita and Milind were heavily criticised for their decision to get married. The supermodel, 52, was head over heels in love with her who is 25 years younger to him. However, their love was determined to fight any obstacle and here they are! Giving us some couple and relationship goals each day.